I think we may have a hot sauce problem. We have an entire shelf in our kitchen dedicated to them. Some crazy hot, some mild but flavorful. Basically, we like to put hot sauce on just about everything. So on our last trip to Holbrook Farm Market we were excited to see some locally made hot sauce. How could we resist? 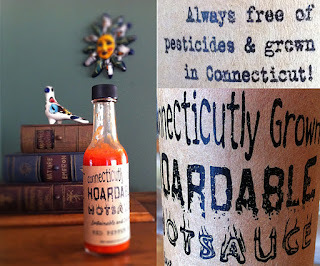 Connecticutly Grown Hoardable Hot Sauce uses fresh, local, organic ingredients. It's produced and bottled in Springdale, CT by Jens Tschebull and Abby Yates. The back story goes that they had been making hot sauce for themselves for years and after hearing "you should bottle this stuff" so many times they decided to do just that. There are five flavors of Hoardable Hot Sauce: Red Pepper, Lemon Thyme, Hot Apple, Cruel & Unusual and Green Pepper. We would have gone directly for Cruel & Unusual (the hottest flavor) but Holbrook's was out of it, so we settled for Red Pepper. We first did a quick taste test on a chip. Not bad. Then we decided to put it on one of our favorite things - eggs. Overall, Red Pepper is pretty mild, but has a nice well-rounded flavor. We'll definitely keep it in the hot sauce rotation, but not so much for added spiciness, rather more for added flavor. 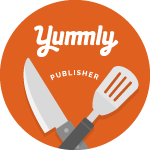 We're going to keep our eye out for the Cruel & Unusual flavor. 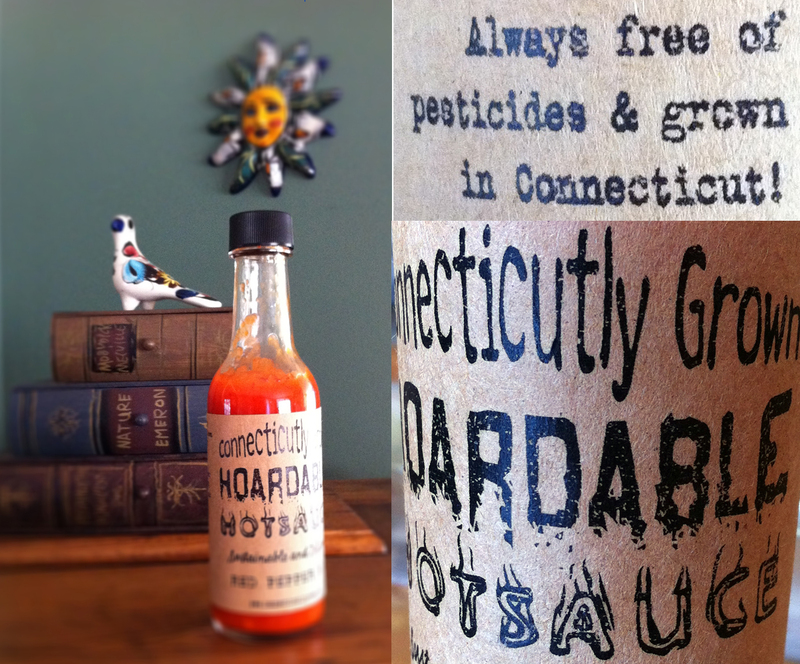 You can find Connecticutly Grown Hoardable Hot Sauce at area farmer's markets and stores. Visit the Hoardable Hot Sauce Facebook page for locations.